People with mental disorder and people who are violent are separately recognised as being at high risk of suicide. People detained in high security hospitals are recognised for their violence to others, but perhaps less so for their suicide potential. We aimed to investigate suicide rates among such patients during and after their high security hospital residency, and to establish risk factors for suicide. We extracted data from the Special Hospitals’ Case Register on each person resident at any time between 1 January 1972 and 31 December 2000. Suicide rates were calculated for the whole period. We compared rates to the general population using standardised mortality ratios (SMRs). We used poisson regression to estimate the effects of gender, legal category of detention, offending history and length of admission on the suicide rate. Of the 5,955 individuals, 218 completed suicide. 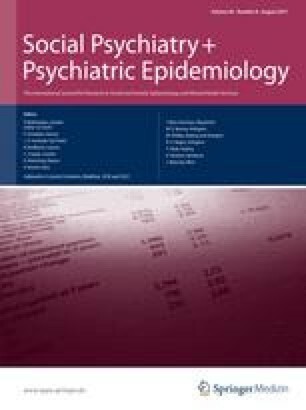 The suicide rate was nearly 7 times higher among resident men (SMR 662, 95% CI 478–845) and over 40 times higher in resident women (SMR 4,012, 95% CI 2,526–5,498) than in the general population; it was 23 times higher (SMR 2,325, 95% CI 1,901–2,751) and 45 times higher (SMR 4,486, 95% CI 2,727–6,245) among post-discharge men and women, respectively. The suicide rate was significantly higher among women than men inside high security but not after discharge. The suicide rate among high security hospital patients was significantly higher than in the general population. Women were especially at risk while resident, whereas for men, the risk was higher after discharge. Many thanks to Robert Cawley, Winifred Höping and Morven Leese for all of their help in the planning and earlier phases of the study. Many thanks to all those in the Special Hospital Case Register Department who have helped collect and input the data, and of course to the patients themselves who gave so generously of their time in the interview process and consented to the longer term follow-up.